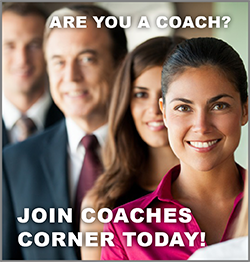 Coaches Corner is a referral and resource service to connect prospective clients with the coaches, consultants, and businesses they need. Coaches Corner works by matching clients with their ideal coach. Our online directory lets potential clients from around the globe find registered coaches based on their knowledge, skills, and expertise. For Clients: Perspective clients who visit the site enjoy free exercises to jump start their goals, and are invited to register to receive promotions and free consultation to allow Coaches Corner to match them with their ideal coach. For Coaches who register as members enjoy the benefits of having a web profile, receiving referrals for potential clients, connecting with others in the coaching industry, and an array of business education and training opportunities. Coming Soon! Our interactive blog site, webinars, and resource pages will feature opportunities to engage in active learning discussions, demonstrations, and support services for both coaches and client members. Our mission is to help our clients accelerate their personal and professional growth. We build bridges between clients, coaches, and effective solutions to achieve overall results with clients. We collectively use creative strategies that systematically link the right clients with the right coaches and the right tools for enhancing quality of life. We seek out coaches and professional independent business owners who are masters at their craft and want to help or teach others. They know how to move clients from where they are to where they want to be. Join Coaches Corner Today! Click here to request an account and set up your profile. Get your profile on the web in no time. Join today and receive a complimentary copy of “Energy Leadership” by Dr. Bruce Schneider, founder of IPEC Coaching. Built for coaches by coaches, Coaches Corner was created in July 2010. Over the last several years we have worked with a team of professionals to design and program the Coaches Corner website to bring about a system that puts members first and is first class. Coaches Corner is administered by The Zweiback Group, LLC.